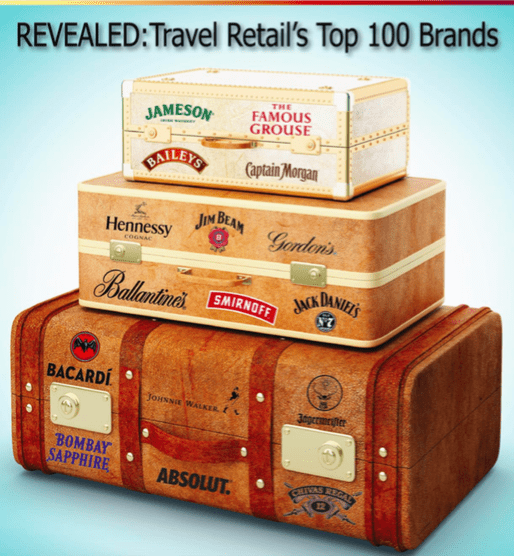 The 10 largest spirits brands in travel retail hold 36% of the total travel-retail spirits market and 45% of the volumes held by the top 100 brands, according to the Top 100 Travel-Retail Spirits Brands list published exclusively in the September issue of IWSR Magazine. Top 10 brands make up 45% of volumes of top 100 spirits. Diageo’s Johnnie Walker remains the clear leader of the travel-retail spirits sector, with volume sales of more than 2.5m nine-litre cases. A 4.2% increase in volumes in 2017 was largely driven by healthy growth of 5% to 7% for each of the brand’s leading variants: Black, Red, Double Black and Gold. Johnnie Walker achieved double-digit growth in its biggest duty-free market, the Gulf, and in other key markets such as Singapore, Malaysia, the Levant, Africa and Russia. Jack Daniel’s exchanged places with Chivas Regal to move back into second position in the top 100 ranking. Travel-retail volumes topped 1m cases for Jack Daniel’s last year after rising by 17%. The introduction of new lines and exclusive items has maintained momentum for the brand. One of Pernod Ricard’s best performers in the Scotch category last year was Ballantine’s, which jumped from 9th to 7th place. The launch of the brand’s first limited-edition product exclusively in the South Korea travel-retail market, and the introduction of a 30yo Cask edition, helped drive sales growth in Asia, a key region for Ballantine’s. Travel-retail spirits volumes rose by a healthy 4.9% in 2017, with growth for almost half of the top 100 brands outpacing that of the category, according to the IWSR, the leading source of data and analysis on the global beverage alcohol market. Read the full list exclusively in the IWSR Magazine September issue. For a previous Inside the Cask blog post on the IWSR Magazine article on ‘Is Travel Retail Delivering Value?’ – click here.